The Pound got hit in yesterday’s session after a series of negative UK data. The Q4 GDP figures, up by 0.2% QoQ as expected, and by just 1.3% YoY, were below the market's forecast of 1.4%. Industrial Production and Manufacturing Production were down in December by 0.9% and 2.1% respectively missing estimates. The trade deficit in December widened to £-3.229B vs. the previous £-2.904B. Brexit is to blame for most of these negative data, with little over a month for the divorce date and no progress in a deal that can satisfy both parties. Today, BOE's Governor Carney is scheduled to speak about the economic outlook and global tensions which could impact the market. 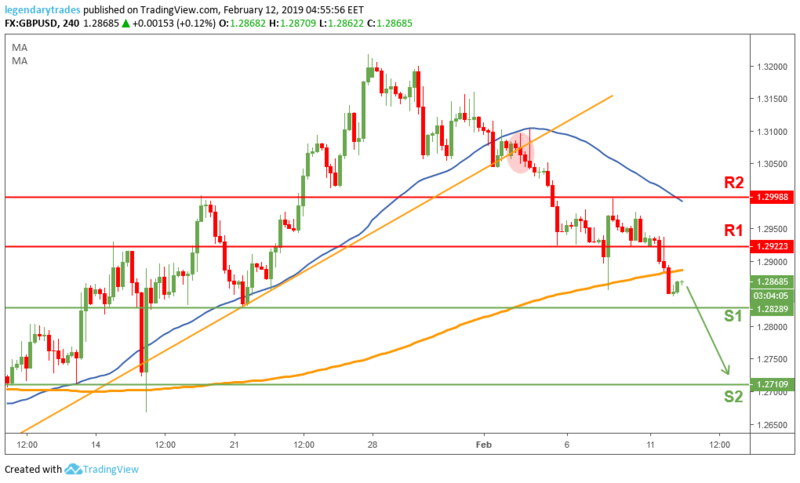 The Pound pierced through the 1.2920 support and the 1.2885 (200-day moving average), but found a short-term support at 1.2850. If price action remains weak, then a retest of 1.2830 (S1) support won’t be farfetched. If the bears push the price lower than 1.2830, then we could face a big potential drop on the Sterling towards 1.2710. The bulls need to close above 1.2920 to stop this bearish momentum.